This wonderful Himalayan ice blue Everest K2 C portable typewriter was imported into Australia and sold here by Tom Koska on Elgin Street, North Carlton, Melbourne (as can be seen by the metal badge on the front). It is now for sale by me. A film study guide to the movie is available in PDF form here. 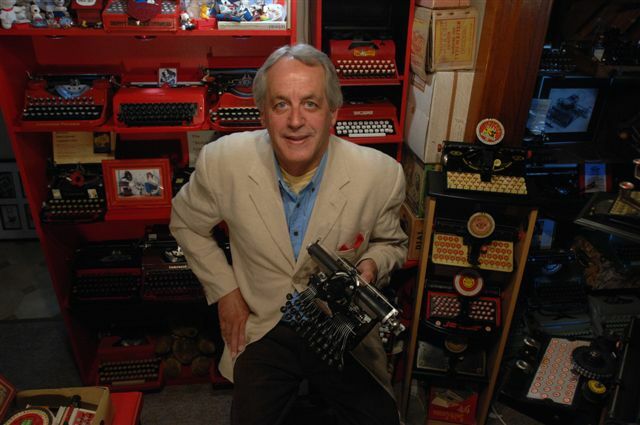 John Wraight, who plays John Hunt and uses the 'Empire Aristocrat' portable typewriter in the movie, as referred to in the study guide. The Hermes Baby I turned into an 'Empire Aristocrat' for the movie. 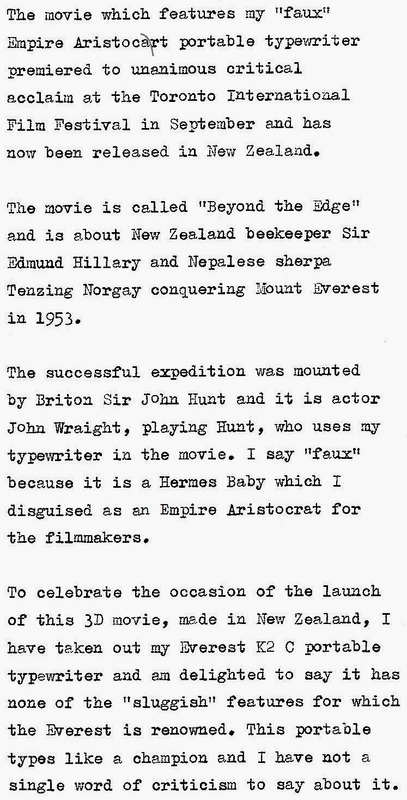 I was excited to see that the same props master who borrowed the typewriter from me for Beyond the Edge was also props master for the NZ movie Mr Pip, which I reveiwed on this blog a few weeks ago. The Toronto Star gave Beyond the Edge 3.5 out of 4 stars. Chad Moffitt plays Hillary and Sonam Sherpa plays Tenzing. The movie is directed by Canadian-born New Zealander Leanne Pooley (who also wrote the script) and is produced by Matthew Metcalfe. The climbers' sons, Peter Hillary and Norbu Tenzing, were at the Toronto premiere. Pooley was delighted with its reception: "When the doors opened, there was a scrum to get in, which was exciting," she said. Variety said the movie "Takes New Zealand film to the peak". Pooley was able to draw on the film Conquest of Everest shot by the climbing team in 1953, some 3000 stills from the Royal Geographical Society in London and audio and written material supplied by the families. Having listened to hundreds of hours of tapes and sifting through the stills Pooley put together the bones of the picture with an animatic. That enabled her to make very precise decisions about what to shoot in the New Zealand Alps and what the lone cameraman would shoot on Everest. “He went off with a 40-page book of storyboards, such as ‘Hillary’s Step,’ a shot looking down a particular face or along the ridge at the top. He also knew that if there was an avalanche that would be useful too,” Pooley said. There was. Timing was crucial. The New Zealand shooting took place in March, shortly before the Himalayas crew sought out the seven-week window in which the weather allows Everest to be climbable. Even the New Zealand South Island shoot was treacherous. Filming took place at 4000 meters and because crew and equipment could not be left overnight, two helicopters ferried them up and down the mountain for five weeks. 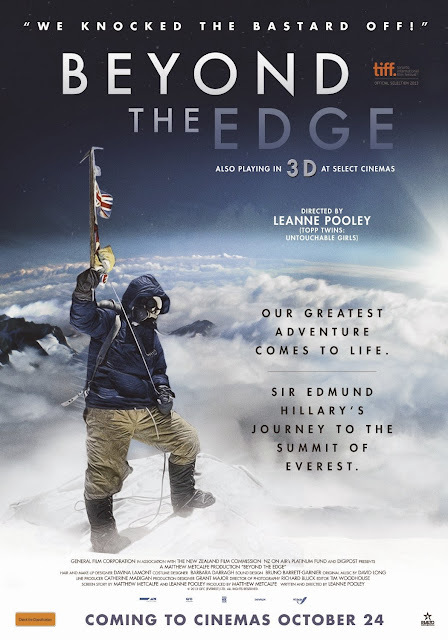 The Everest footage was shot in 2D and later converted to 3D, while the NZ material was originated in the 3D format. I'm surprised you didn't have an Empire Aristocrat in your vast collection, Robert. :) How did you obtain or create the decal? I meant to say "film crew" in the Southern Alps. Sorry. I'm not "here" in the Southern Alps! Everests' quality and feel seems to vary a lot. What does the "C" in its name designate? The Everest film sounds fine. I wonder how they can convert 2D to 3D! Awesome! Thank you for the links. Loved the Golightly Riter!